A war movie almost devoid of war, Jarhead is more interested in exploring the soldiers' psyche and crushing sense of alienation during the long wait for action. It's 1998, and laidback Anthony Swofford (Jake Gyllenhaal) enlists with the US Marines to follow in the footsteps of his father, a Vietnam War veteran. After struggling to adapt to the military culture and the rigours of training, Swofford finds a home with the Scout Sniper program under the tutelage of Staff Sergeant Sykes (Jamie Foxx). He is eventually paired with spotter Alan Troy (Peter Sarsgaard). After Iraq invades Kuwait in August 1990, Swofford's unit is among the first to be deployed to the desert to protect Saudi Arabia's oil fields in Operation Desert Shield. Long days, weeks and months of abject boredom follow, the men struggling to control their pent-up aggression as they wait for the start of combat operations, with Swofford gradually sinking into depression. An adaptation of Swofford's memoir directed by Sam Mendes, Jarhead is an unyielding journey towards physical and psychological frustration. The absence of action is far from an obvious war movie topic, but Mendes and screenwriter William Broyles Jr. extract remarkable potency from the internal struggle to stay sane. This is a story about waiting, and the crushing fog of restlessness descending on men primed for action being ordered to essentially do nothing in the middle of nowhere. The first act features the typical military training culture shock and drill sergeants screaming insults at raw recruits. With Swofford introduced as smarter than the average recruit and therefore less easily adaptable to strict military regulations, this material is potent but familiar from the days of An Officer And A Gentleman and Full Metal Jacket. In Jarhead, the training does lead to deployment, but this is where the film takes a left-turn. The American troop build up in the desert started in early August 1990, and combat operations erupted in the middle of January 1991, by which time close to 700,000 American soldiers were in the field. Jarhead recreates what five and half months of inactivity can do to soldiers. Endless repetitive training and hours to kill invariably decay morale and enthusiasm, as Swofford and others turn on each other and lose discipline and sharpness. They also become obsessed with what their girlfriends and wives must be up to back home, the limited communications feeding an insidious sense of abandonment. Swofford reads between the lines of his girlfriend's letters and a scratchy phone call to conclude that she is undoubtedly cheating on him. Other wives are graphically unambiguous in how they message their men. When the push to liberate Kuwait finally gets underway, the war ends within literally hours of starting, adding to the retrospective sense of unfulfilled expectations. The ground troops are reduced to chasing a war being won by airpower well ahead of them. Here Mendes excels in capturing lyrical landscapes of an asymmetrical battle, Sykes, Swofford and the other men coming across an Iraqi army literally and figuratively pulverized in place. 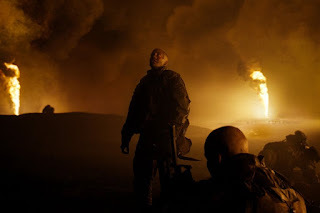 The recreation of hell-on-earth courtesy of burning oil fields and black rain is visually stunning. Jake Gyllenhaal captures one man's disbelieving descent into the alternate reality of military life. Gyllenhaal ensures Swofford is never comfortable in uniform, and serves more as an incredulous observer surviving rather than actively participating in the gung-ho life. The rest of the all-male cast members do their best to provide definition to the many enlisted men, with limited success. Jarhead exposes the unglamorous and unheroic side of war, where dreams of bravado meet an unlikely foe in the shape of wretched tedium.